You’re a preacher and you know you need to address the assault against humanity and our planet that is being perpetrated by the Trump administration. But some things are holding you back. Maybe you don’t feel informed enough about certain issues. Maybe you don’t feel you received enough training in seminary for how to preach a prophetic sermon. Maybe you’re afraid of the push-back from members of your congregation if you tackle topics that seem too “political.” Or maybe you just need a shot of homiletical chutzpah. Preaching in the Era of Trump is like a much needed urgent-care facility for preachers reeling from the election and its aftermath. Wes Allen offers not only an accurate diagnosis for how our country and the church has found itself in this place of crisis, but prescribes effective strategies for preachers to address the fear, turmoil, prejudices, hatred, and divisiveness of this time, as well as the need for proclaiming prophetic justice. While never mincing words about the staggering array of evil now before us, Allen also reminds us in this must-have book that the preacher’s task is to address the humanity of our congregations, even while casting out the demonic forces that hold us in thrall. You’ll be reading this book in preparation for Sunday, April 2, the day after April Fool’s. There will be many times when you feel like an utter fool in the pulpit against the powers of evil-on-steroids that have strengthened with this president. Campbell and Cilliers’ book will not only help you rethink and reframe the homiletical task, it will equip you with stories, images and metaphors for helping your congregation celebrate their role as “fools for Christ,” proclaiming the message of the cross that tells the truth and calls the gospel-reality into existence. With Mother’s Day this month, the focus is on women. The onslaught against women’s access to reproductive health and their right to choose how to make decisions about the most intimate parts of their bodies is exacerbated by a misogynist president who bragged about sexual assault. Nearly every congregation in this country has victims, survivors, or perpetrators of sexual and domestic violence in its pews. This is the book I recommend for preacher who need sage guidance about how to address these issues as a pastor and a preacher. The collection of 15 essays covers theological and biblical perspectives, provides resources for telling the truth about sexual and domestic violence, gives practical how-to’s for preaching, and includes model sermons. This is an ideal time to familiarize yourself with the standpoints of “the other.” Whether you are a white preacher looking for an essay from an African American woman’s perspective (provided by Teresa Fry Brown), or an African American preacher wondering how Korean Americans fare in this country (explained by Eunjoo Mary Kim), or a Latina/o preacher wanting to help your congregation understand the Jewish perspective on justice (shared by Stacy Offner), these and five other essays will expand your preaching horizons. The summer is a good time for a sermon series on the ways in which systemic evil attacks “the least of these.” While Moe-Lobeda’s book is not aimed at preachers per se, her approach to the complexity of interrelated structures of evil is very helpful for sermons because she provides case studies that give us glimpses into the lives of real people affected by the decisions we make every day. The first half of the book will give you incredible insights into the economic and ideological patterns that gave rise to Trumpism in the first place, while the second half of the book provides concrete approaches to galvanizing yourself and your community for resistance. You’ll be reading this book in preparation for leading a series of conversations in your congregation about some of the “wicked” (i.e. complex) problems our country is facing. The task of preaching about difficult social justice issues is helped when we have cultivated a culture of dialogue in our congregations. Under the Oak Tree contains eleven essays to help you think through the concept of conversational practical theology and how to view the tasks of ministry (including preaching, worship, evangelism and interfaith relations) through this lens of conversation. With the “community of conversation” as your frame of reference, you’ll read Tisdale’s book to give you that infusion of courage for addressing social issues in the pulpit in tandem with the dialogue series you’ll be leading this month. The author suggests a myriad of reasons why pastors resist preaching about justice issues and offers practical suggestions for ways to be both pastoral and prophetic in their preaching. This book offers specific strategies to break through resistance as well as a variety of forms to help spark your prophetic imagination. The month of October brings out the ghosts and goblins as our culture celebrates Halloween. Consider a sermon series entitled “Something Wicked This Way Comes” and address the true demons loosed on our society. Christine Smith’s book gives you the theological and biblical tools to address handicappism, ageism, sexism, heterosexism, white racism and classism. The last chapter provides some model sermons to prime your preaching pump. Preaching Politics: Proclaiming Jesus in an Age of Money, Power, and Partisanship; Clay Stauffer (Chalice Press, 2015). November is usually the month when churches launch their stewardship campaigns. This year as we contend with a president who wouldn’t even be forthcoming about his tax returns or divest himself from his companies, help your congregation understand why Jesus’ teachings speak a necessary ethical corrective. Stauffer provides a guide for understanding the need and biblical justification for preaching about the politically contentious issues of money, greed, and power within a capitalist society. With sound exegesis of key teachings of Jesus on money and faith, as well as robust theological engagement with Stanley Hauerwas and Adam Hamilton, this book is useful for both preaching and leading Bible studies. Stauffer encourages, equips and emboldens preachers to tackle these issues from the study and the pulpit with renewed confidence. If you follow the Revised Common Lectionary, the Advent readings contain the apocalyptic texts of Jesus. The Bible does not shy away from naming the upheaval in our world, and neither does Swedish. Yet she challenges us to articulate what kind of human beings we will be as we approach this difficult period in human history, and how we will live into that. With solid biblical exegesis (especially her treatment of the “loaves and fishes”) your preaching will benefit from the way she clearly presents the values, vision, and spiritual resources that can nurture a new human community even when the evidence points to the world falling apart. The Rev. Dr. Leah D. Schade is the Assistant Professor of Preaching and Worship at Lexington Theological Seminary; Lexington, Ky. Contact her at lschade@lextheo.edu. 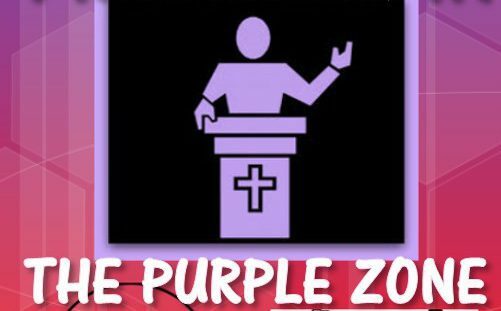 And visit The Purple Zone website to learn more.